First up is The Moment of Truth (Il momento della verità), by Francesco Rosi. In brilliant Technicolor, the post-neorealist Rosi documents the short lived rise to stardom of Miguel (Miguel Mateo), from down-and-out migrant worker to top-ranked matador. Miguel leaves his poverty-stricken hometown to come to the city for work before succumbing to the lure of quick, big money as a bullfighter. After training under the watchful eye of retired torero Pedrucho (playing himself), Miguel begins his rapid ascent to fame and fortune as Miguelín (the same name Mateo went by in his real-life occupation as a toreador). After surviving being gored, the increasingly shaken Miguelín seems bent on pulling out of his hazardous career as soon as he fulfills some contracted corridas at the behest of his greedy agent (José Gómez Sevillano). Unfortunately, anyone familiar with the heist or fight movie trope in which the hero promises he'll retire after one last big score or match can guess what fate awaits the naive Miguelín. The Moment of Truth uses actual bullfighting footage to lend itself some authenticity, so some may feel, whether for reasons ethical, philosophical or just plain nauseating, that this movie may not be right for them. Having grown up accustomed to ancestral stories of the nobility of such matches between man and bull, I wasn't as averse as some might be. At the very least, from a purely anthropological point of view, it is quite fascinating to see the rituals attached to what many call a bloodsport. Rosi trains his voyeuristic eye on everything from Pamplona's running of the bulls during the festival of San Fermín to the careful suiting up of Miguelín in his traditional traje de luces (literally, "suit of lights"). Each time Rosi elevates bullfighting to a nearly spiritual level. Of course, the exploitation of Miguelín—a young, handsome, athletic man with no other opportunity to provide for himself and his family—deliberately belies the sublime religiosity of bullfighting that Rosi presents. Certainly, the director is sympathetic to Miguelín's plight. But when, at one point, Miguelín's agents and sponsors intimidate him into returning to the ring before he has completely healed from his goring, the parallels between the profiteering off of the matador and the protracted barbarism of the animal's execution becomes apparent. Like his former mentor, Luschino Visconti, Rosi uses color and photographic virtuosity to highlight the plight of the proletariat while mourning the passing of an era of nobility, in this case one in which bullfighting represented something nobler than the lucrative gladiatorial sport it has become. Whether it's the amber dustiness of Spain or, in the case of this next film, the sodium smogginess of Mexico, Traffic makes clear that exploiting humanity is universal. Reissued on Blu-ray this week by Criterion (timed to the theatrical release of its director Steven Soderbergh's newest film, Haywire), 2000's Traffic has more in common with the filmmaker's recent Contagion. Both movies share a multi-pronged structure that allows the auteur to analyze the causes and effects of a national health crisis. Traffic is the more complex work of the two, as its subject, the U.S.-Mexican drug war, has financial and multinational components that Contagion only glancingly examined. Here are the two things which most struck me about revisiting Traffic over 10 years later. First, Soderbergh is quite effective in making sure his audience doesn't lose their bearings as he switches back and forth between its Mexican plotline (starring Benicio Del Toro and Tomas Milian as law enforcers on opposing sides of the war), its Washington D.C. storyline (starring Michael Douglas as the new U.S. drug czar and Erika Christensen as his daughter), and its Southern California thread (starring Catherine Zeta-Jones as the beleaguered wife of a drug middleman and Don Cheadle and Luis Guzman as the cops surveilling her). Of course, the then-innovative filtered, desaturated cinematography he used to color code each component soon became cliche when even popular TV shows like 24 started incorporating it into their aesthetic repertoire. The second thing which struck me: Benicio Del Toro really earned his Best Supporting Actor Oscar for his magnetic turn as the cautious Javier Rodriguez Rodriguez. Though probably the most minimalist player in the entire, all-star ensemble, Del Toro is the viewer's true surrogate and entry into Traffic. 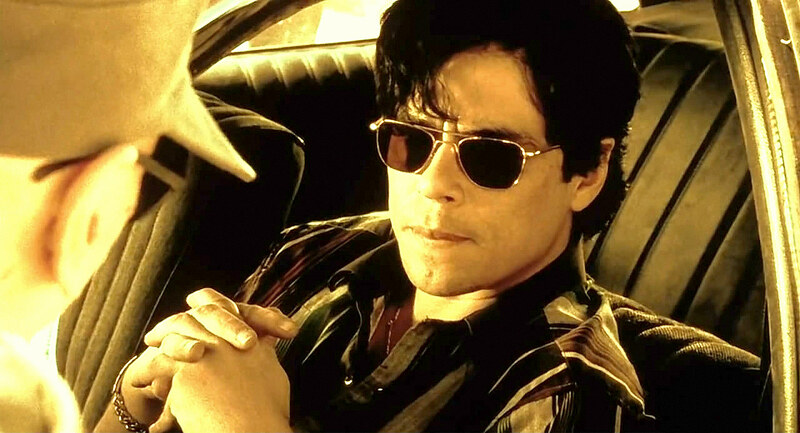 Javier may represent the frustrated, anonymous, blue-collar soldiers on the front-line of the war, but through him, Del Toro makes us sympathize with the effects of the drug crisis in a much more personal way than Christensen does through her character, the heroin-addicted daughter of Douglas's drug czar. Del Toro's ability to subtly convey the feelings of what is a largely internal, repressed do-gooder no doubt led to Soderbergh's decision to cast him as the titular revolutionary leader of his two-part Che biopic. Del Toro's performance remains the single best reason to revisit Traffic.